The Motivational Cards have been created with the idea to give a positive message to whoever chooses one. Ask the spectator to think of something that he wants to achieve in his life and show him a set of cards with motivational quotes on them. Ask him to cut the deck however many times he wants, once completed tell him to choose one card. That card, you explain, will give him an “answer” as to which state of mind to take in order to achieve his goal. He will silently read the message to himself, that will make him think of which action to take in order to move towards his goal. Now you ask him to concentrate on the image that is in the background and to visualize going on a mind journey. After a few moments you will be able to read his mind, revealing the image he chose. These cards are based on a classic mentalism principle that is very easy to use, leaving you in full control of the presentation. You can use them for mind reading, Q&A acts, drawing duplications or simply ask a spectator to take one card and feel motivated! The cards are made of high quality laminated material and come stored in a very elegant box. You will also receive a card with a link to download the instructional PDF. 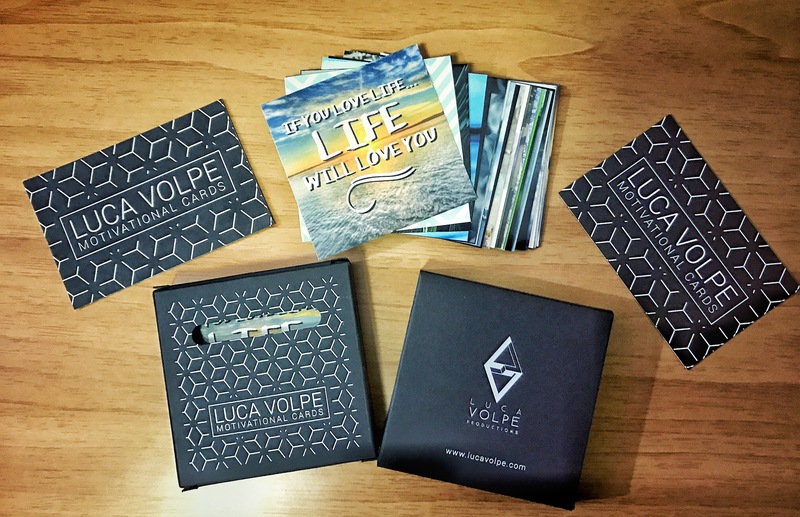 Only available directly to Luca Volpe at his lectures or motivational talks. Price 30€. Where do I pay to get a set? Is available worldwide to all magic shops. Previous Previous post: LEARN MENTALISM ON VACATION! Next Next post: AUGMENTED IS NOW AVAILABLE!